Who wants to be swallowed by a Tyrannosaurus (Not real! Not possible! You stinking sci-fi nerd!) The process is simple, mosquitos were back in dinosaur time too, so since people didn't exist, they probably drank dino-blood instead. Ever heard of amber? It's when a prehistoric insect gets stuck in tree sap frozen in time to be found by scientists. You could eject the blood from the perfectly preserved mosquito, straight from the stomach. Assuming the blood they drank was from a dinosaur, you inject it into that of a crocodile or other reptile, filling in the hole in the DNA code that once made them large and vicious. That makes the egg from the reptile a dinosaur, right? Since the code has been filled, right. The issue is, the blood would have been dry after 65 million years, and if it was the same, the outcome would be a cross breed , not tyrannosaurus, so your either going to have a frogasaurus rex hopping through your village, or be seeing a tiny brachiosaurus hopping through your pond, so don't plan on playing Capture The Raptor with out being eaten any time soon. 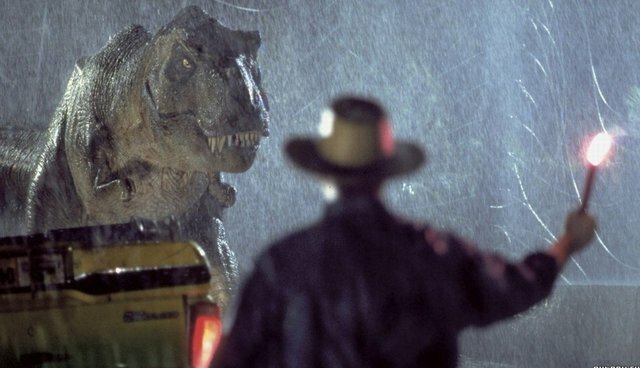 JURASSIC PARK 4 IS COMING SOON THOUGH, so go by 333,000,000,000,000 dinosaur related objects to up the hype factor.